The Hohenstein Institute offers testing, certification and research to do with textiles. This means it’s more than possible that managers responsible for the procurement of workwear for their organisation will have been influenced in some way by the product safety expertise Hohenstein has. Testing Personal Protection Equipment (PPE) is an expanding part of Hohenstein’s work. Mariana Schubert, Head of the PPE Test Centre, gives us an insight into the work of her team. Nowadays, Personal Protection Equipment, or PPE for short, is an important part of the safety provision in a number of different jobs. Many workers in industries such as steel or construction, road workers or firemen wear special clothing to increase their safety, and protective clothing is also compulsory in these jobs. PPE is professional or working clothing, from gloves and goggles through to workwear, that has been made to meet special requirements and is designed to protect the wearer from various different risks. Why are there special tests for PPE? With PPE, the main priority is to protect the wearer. It therefore has to perform a specific warning function, or protect the wearer from external factors such as heat, flames, cold, electric charges or even rain. In Europe, PPE has to carry the CE mark, and for that the clothing has to be tested by an approved certification centre. As confirmation, the customer receives an EC Type Examination Certificate. The Hohenstein Institute is an authorised certification centre (0555) for PPE. Workers in many industries are exposed to hazards such as Arc flash or molten splashes, and need to wear heat resistant or flame retardant garments. 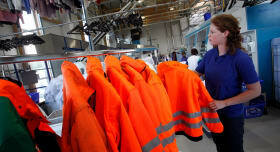 Foundry workers or oil rig operators might benefit from such specialised clothing. Firefighters’ clothing is in the highest category of PPE, because it has to provide several different kinds of protection. How is that reflected in the tests? With firefighters’ clothing, testing the materials is really critical for the safety of the wearer. The textiles have to be tear resistant as well as fire and heat resistant. The design and high-visibility markings also increase safety; for example, firefighters’ clothing has a very specific arrangement of reflective stripes to ensure that the wearer can be seen in any conceivable body position. This also makes the clothing very easy to recognise. The heat and flame resistance of firefighters’ clothing can also be tested with the help of the Thermo Man in Geneva, in cooperation with DuPont. You must certainly never lose sight of how significant the human factor is when it comes to wearing PPE. The best PPE is no use at all if people don’t wear it correctly, or at all. It is particularly important that the garments are comfortable to wear, if they are to be well accepted, because they have to be worn for several hours while doing heavy physical work in all kinds of climatic conditions and under various physical stresses and strains. That’s why testing the physiological properties, from the point of view of comfort, is an important part of assessing and optimising PPE. You may be wondering how comfort can be tested objectively, and in laboratory conditions. There are two important aspects of comfort which need to be considered: these are breathability and heat insulation. For textile materials, these are calculated using the so-called skin model, in compliance with DIN EN 31092 or ISO 11092. The material is put on a heated, porous, sintered metal plate, through which condensation can pass. The measuring process takes place in clearly defined climatic conditions. We can calculate the permeability to condensation, which tells us how much moisture is absorbed by the textile material and how much is given off into the atmosphere – e.g. this tells us how breathable it is. We can also calculate the heat loss from the metal plate and therefore how good the thermal insulation is. For which kind of PPE do you think it is particularly important to optimise the comfort for the wearer? According to a study in the USA from just a few years ago, in 49% of the cases where firefighters died on duty, the cause of death was circulatory collapse. The reason was that the protective clothing did not take sufficient account of physiological functions. For a long time, the main focus for development work on PPE was protection from heat and flames. Today we know that it also has to help with the body’s cooling functions by effectively wicking perspiration away from the body. When people are working on the roads, being visible to others is very important. What needs to be taken into consideration there? In principle, warning, or ‘high-vis’ clothing can be divided into three classes, with Class III setting the highest specifications for its warning effect. There has to be a set number of the reflective strips that are responsible for night-time visibility on the garment, arranged in a particular way. DIN EN 471 also gives clear specifications for the design and for the fluorescent background material, which ensures high daytime visibility too. PPE has to provide protection not only when it is new, but throughout its service life. Indeed, to make sure of that we also test some of the clothing after preliminary treatments. That includes, for example, washing the garment five times, and then testing its strength and flammability. For rainproof clothing, the textiles are put under mechanical strain by creasing and rubbing them 9,000 times, and then they are tested to see if they are still waterproof. We can also simulate ageing in textiles, by exposing the material to xenon light and moisture - this artificial ageing is an additional test which any customers who are interested can use as an extra way to test their products. In our textile testing laboratories, we calculate a rating for the resistance to abrasion and creasing of the textile materials that are being used, and their resistance to tearing and splitting. In our ‘textile torture chamber’, we have a whole range of measuring devices available. What is the best way of looking after PPE so that it can be used for as long as possible? If the protective clothing is washed at the wearer’s home, then the washing instructions must be observed. Nowadays, however, more and more textile PPE is processed in commercial laundries. To make sure that this equipment also lasts as long as possible, our experts have defined a special test routine for textile services providers. This means it can be defined in advance how many wash cycles the textiles can go through without greatly reducing their protective effect. In the fire protection test, firefighters’ clothing (EN 469) and clothing for protection against heat and flames (ISO 11612) has a flame applied by Bunsen burner for ten seconds - the sample should not burn or glow for more than two seconds afterwards. The flame is applied to the flat surfaces and, optionally, also to the edges of textiles in a new and used condition. The heat protection of textiles is tested in a heating cabinet. In this test, the changes in textiles are measured at temperatures of either 180° C or 270° C. To do this, a measured line is applied to the textile before the test so that the shrinkage of the material under the effect of heat can be assessed. The bursting strength of a textile sample is tested by stretching it in a measuring device and then causing it to arch up, hydraulically or pneumatically. The device measures the pressure required to split the fabric. The Thermo Man is an articulated manikin made of a compound of epoxy resin and fibreglass and fitted with 122 highly sensitive sensors. It is used to test the heat and flame resistance of firefighters’ clothing. During the test, it wears the complete outfit and is then exposed to a flame for eight seconds at more than 1,000° C – that is the temperature of molten lava. This is how the much feared surface flash is simulated, when the flame propagates extremely quickly (at more than 100 cm/sec) over the surface without damaging the underlying structure. Because the flames spread so quickly, the risk of burning is very high. The measurements enable this risk to be assessed for firefighters’ clothing and the survival chances of the wearer to be calculated. In abrasion testing using the Martindale method, a standard woollen fabric is rubbed over the test fabric until at least two fibres of the material have broken. The number of cycles this takes is measured. This test tries to simulate the effect of rubbing while the clothing is being worn. The number of rubbing cycles for working or protective clothing is far higher than for the trousers of a smart suit. The test to calculate crease-resistance simulates areas under particular strain, such as elbows and knees. 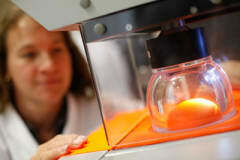 The material is creased, turned and squeezed 9,000 times in the test device. Even after this tough treatment, the product-specific functions such as waterproofing should not be lost. Another test of the longevity of clothing is to work out its tearing strength. The textiles are stretched in the tensile testing device and the force that is needed to make the material tear is measured (maximum tensile strength). The test for resistance to tear propagation measures the force needed to cause the textile to tear further from an existing incision. Thermo-Man® is a life-size manikin equipped with 122 heat sensors, which is dressed in test garments and is then totally engulfed into flames generated by propane gas burners. ?This test exposes the garment surface to a flash fire with temperatures rising up to?1,000° C, thus simulating a typical industrial heat and flame incident. This excess fuel fire?simulator validates the garment’s protective performance and integrity against heat?and flame. The thermo-sensors record the temperature rise on the surface of the mannequin while a computer simulation programme calculates the predicted percentage of second and third degree burns a person might suffer on their body under similar conditions; the position of the burns, and the percentage of burns compared to the total body mass; the burn evolution over the measuring time, resulting in the person’s chance of surviving the incident (in a percentage) in conjunction with the victim’s age. All PPE is subject to the European Norm EN 340 specifying general requirements for protective clothing. It is the user’s responsibility to carry out a risk analysis and elect the appropriate personal protective equipment.